I’m 3 chapters in now. 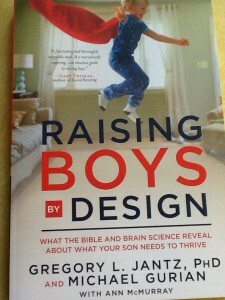 I fully agree with Chapter 1: Our Sons Need a New Approach to Boyhood. As a “boy mom,” I’m well aware of the fact that society and social institutions don’t always value boys’ approach to life. When I read, “Boys as a group…need to know they are not inherently flawed or inherently defective simply by being born male,” I nodded in vigorous agreement. The book, Chapter 1 says, “begins from the perspective that boys are designed to value and strive toward a mantle of maleness and that our culture is very hard on that maleness.” Do you agree with those statements? I do — but I think part of the reason our boys struggle is because our society hasn’t agreed on a healthy definition of “maleness.” Rosalind Wiseman wrote about the Act Like a Man Box in Masterminds & Wingmen, and for the most part, I think our societal definition of maleness is far too narrow. I think that one thing we can to improve the lot of boys is to work to expand that definition. Chapter 1 encourages us to begin that work by looking at our own gender biases, by asking us to identify what stereotypes we have about boys. I’ll be honest: that’s something I worry about here on BuildingBoys. Sometimes I think we may overly promote the idea of boys as active, messy and disruptive. And sometimes I worry that by accepting those things as ‘boy” in my own boys, I might be unconsciously molding them to the stereotype. In truth, I know that boys come in all shapes and sizes and sensitivities. Boys can be interested in anything, can do anything and should be accepted and welcomed as “boy” no matter what. 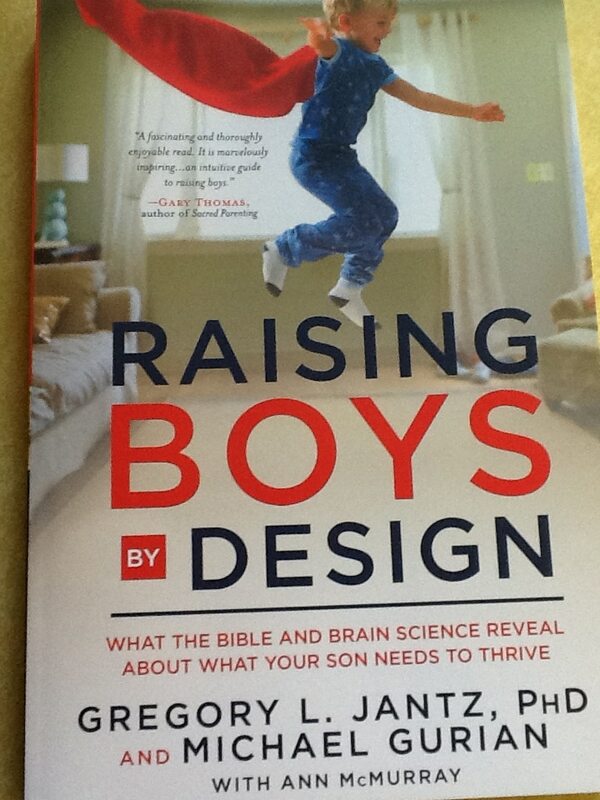 Chapter 2, Boys Develop Differently Than Girls, delves into the differences between boys and girls. Were you surprised by anything you read? Did you ever find yourself nodding in agreement? Because I’ve been learning and thinking and writing about boys for so long, most of the info in this chapter is old hat to me. And I have to say, I’ve recently decided that it really doesn’t matter if the differences we see are brain-based or nurture-based. (Some books, like Pink Brain, Blue Brain: How Small Differences Grow Into Troublesome Gaps — And What We Can Do About It , argue that Gurian and others have made far too much of subtle and small biological brain differences.) But given that my goal is to help boys grow into healthy, whole human beings, it really doesn’t matter if the boy in front of me is acting in a particular way because his brain is wired in a certain way or because he’s been pushed in that direction by society. What matters is that a boy is acting in a certain way, and I need to interact with that boy in a way that’s respectful to him, while helping him learn and grow. What do you think of the book so far? I have to say my feelings are mixed. I love reading books about boys. I love reading Christian and inspirational books. I’m just not all the comfortable combining the two, and here’s why: Parenting, educating or working with boys is a complex endeavor. I don’t think there’s any one “right” way to do it, so when people try to use religious scripture (of any kind) to support a particular approach, I feel a little leery. OK to write/draw about poop, guns, etc. What 5 adjustments would you like to see? I’m still on Chapter 1 but I love the combination of the biblical/Christian and science perspectives. I think if more people, including moms, would expose themselves to this type of thinking/paradigm, we could really do so much to help our boys and young men. I appreciate their revisiting the basic premise that boys and girls are indeed different, and their intentional mention also of the complimentary nature of their differences. We have underestimated the vehemence with which many in the social sciences and education have been influenced by feminist and other groups’ ideology that has pushed the notion on us that any and all differences between males and females need to be minimized and overcome by women. That thinking has led to much harm, not only for boys but for girls as well. I look forward to working my way through this book. The subject matter is greatly impacting my life right now, and reinforces my commitment to help my sons relearn how to celebrate, maximize, and enjoy their maleness!! Long live boys (and men)! So glad you’re enjoying the book, Chandra! I agree that there’s much to be gained by appreciating the ways males and females complement each other and contribute to the world. Certainly, I believe that men and women, boys and girls, should be free to follow their interests and passions, and not consigned to strict gender rules. But I also think it’s time to realize that we each come into the world with unique gifts.